There is something remarkable about the government whose tenure is about to end. The government started on a note of vendetta and illegality. Strikingly, the same government is ending on the same distasteful note. 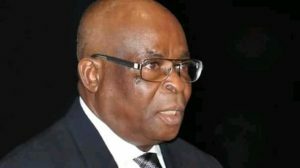 The ongoing ordeal of the Chief Justice of Nigeria (CJN), Justice Walter Onnoghen, may be a fitting nunc dimitis for a government most of whose actions, and sometimes inactions, constitute a blatant assault on the rule of law. What could be responsible for this extinguishing characteristic of the All Progressives Congress-led government at the centre? Is it President Muhammadu Buhari’s vengeful inclination that infected the government or are the dark pilots of the affairs of the government power-drunk? How did it all begin? Let us do a little recap. After his victory at the polls and subsequent swearing-in, Buhari retreated into his shell. Many thought that he was trying to take a short break from the excruciating campaigns that ushered him in as president. Surprisingly, weeks rolled into months and the president remained in the conclave. There was no activity. The government many thought would hit the ground running could not take off. That notwithstanding, Nigerians who had so much confidence in the president thought he was coming up with something momentous. They thought that he was getting set to give the country a new lease of life. But what did they get at the end of the long wait? A horde of recycled and mostly tired hands and legs as the major drivers of his administration. Going by the mood of the country at that time, Nigerians would have put up with the jumble that was the president’s team. But there was something shocking about it. The president who declared on the day of his swearing-in that he was for everybody and was for nobody exhibited the very opposite of his declaration. What rankled here was his vengeful exclusion of the South East from the commanding heights of his administration. He said the zone did not vote for him and must, therefore, be paid back in its own coin. The latter-day declaration which informed his lopsided appointments did not bear out his exuberant declaration on May 29, 2015. That was the beginning of the problem. But his spite for the South East was still being repudiated when he took on the former National Security Adviser, Col. Sambo Dasuki. In December 2015, operatives of the Department of State Services (DSS) arrested Dasuki and clamped him in detention. He was accused of illegal possession of arms. The charges against him were later to be expanded to include money laundering. Government alleged that he misappropriated some $2.1 billion meant for procurement of arms during the administration of President Goodluck Jonathan. But whatever the charges may be, the fact before us is that the alleged offences for which Dasuki is being detained are clearly bailable. That is why he has been granted bail six times by various courts of law. Yet the government has remained adamant. It has refused to obey the orders of the courts. In fact, the pronouncement of the judge that granted Dasuki his sixth bail was instructive. The judge, Justice Ijeoma Ojukwu of the Federal High Court, Abuja held that the continued detention of Dasuki amounted to violation of his right to liberty. She, like others before her, ordered that Dasuki be released on bail but should be invited for further questioning anytime the DSS had cause to do so. The order, as usual, was roundly ignored by the authorities. From the way things stand, it is as clear as crystal that Dasuki will not regain his freedom in the life of this administration. Then, for some time now, the gadfly called Dino Melaye has been having a running battle with state authorities. The government is out to deal a devastating blow on him and it is not making any pretences about it. The senator has been in and out of police detention. Security agents have severally laid siege to his residence. He has been harassed, maligned, persecuted and incarcerated. The simple reason for this is that Dino is an uncompromising critic of the Buhari administration. Sadly, the government has no stomach for contrary views. Dino is a thorn in the flesh of the administration, and the government, characteristically, has resorted to illegality and strong arm tactics in order to get at Dino Melaye. A number of other infringements coming from the government of the day abound. But the latest bitter offering from the government is the ongoing persecution of the CJN, using the Code of Conduct Tribunal as a vehicle. With less than one month to the presidential election, the government has finally thrown constitutionality and the rule of law to the winds. It has put Dino Melaye away so that government will have some breather in Kogi State and elsewhere. As a matter of fact, the government has lately been taking steps that are suggestive of desperation. Observers are seeing a government that wants to employ all manner of arm-twisting tactics to hang on to power. That was why, in trying to put Onnoghen away as it did Dino, government conveniently forgot that there are rules and procedures that must be followed in the trial of a judicial officer. Legal minds have since reminded government of a 2017 Appeal Court decision in Nganjiwa vs Federal Republic of Nigeria to the effect that any misconduct attached to the office and functions of a judicial officer must first be reported to and handled by the National Judicial Council (NJC) pursuant to the provisions of the law. Government, certainly, is not unaware of this judicial precedent. But it has, to the consternation of the watching world, chosen to break the law, which it is supposed to uphold and protect. Watchers of our polity find government’s disposition worrisome. They are easily reminded of where this government is coming from. They have not forgotten that this government was put together by people who laid so much claim to their democratic credentials. They never believed that any government, be it military or civilian, was anywhere close to what democratic practice entails. They were mostly the NADECO (National Democratic Coalition) chieftains and “June Twelvers” (if you permit the coinage), who pontificated tirelessly about good governance, democracy and rule of law. So, what has become of this breed so much so that they have become worse than those they used to criticise and hold accountable? You could say that that is the way of the world. But those who flounder in the course of duty must have the humility to accept their inadequacies. To grandstand in the face of obvious misgovernance is tyranny and dictatorship at its most banal. Someone should tell the government of the day to apply the brakes. Someone should remind it that no condition is permanent. The dictators of yesteryears have become history. And history has an unfavorable verdict for them. How does this government want to be remembered? As a dictatorship, which trampled upon the basic rights of people and institutions? Or as one, which came, tried its level best, and allowed the wheel of governance to roll on unhindered and unfettered? History is waiting in the wings to put the government in its proper place.